Vertigo is a common condition no matter what a person’s age is. In fact, about 10% of people suffer from this false sensation of movement that may be described as a spinning feeling or even as motion sickness despite being still. However, after age 40, the number of people who experience vertigo dramatically increases. Researchers went about examining this phenomenon. Why Is Vertigo Such a Concern? 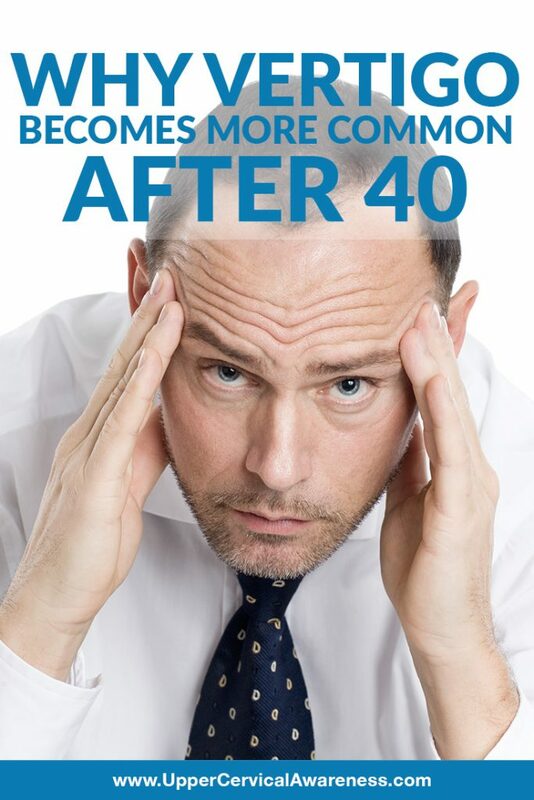 The research revealed that after age 40 the amount of sensory information that is required to trigger the vestibular system doubles every decade. That means at age 50, your body needs twice as much information to maintain balance and spatial orientation as it did at 40. At 60, you need four times the info you needed at 40, and so on. It’s no wonder that about 1 in 3 seniors over the age of 65 have a fall in a given year. It is also estimated that issues with the vestibular system are involved in approximately 152,000 deaths per year in the US. That means that while vertigo is considered non-life-threatening, the falls it may cause are still very dangerous. Thus, a person experiencing vertigo should seek care rather than accepting it as a part of getting older. What can help? Data from case studies indicates that many cases of vertigo are the result of long time misalignments in the top two vertebrae of the neck, the C1 and C2. Subluxations in this area can inhibit blood flow to the brain, affect brainstem function, and also affect the vestibular nerve that is responsible for sending information between the ear and brain about balance. A visit to an upper cervical chiropractor is the best way to find out if you have this type of misalignment. Especially if you have ever suffered a head or neck trauma, the results of correcting this type of misalignment may be significant. To learn more, find a practitioner near you.